Join us for a special 4-hour pastry fundamentals class that will cover serious and useful cookie baking and decorating techniques and tips that will have you can making your own colorful and unique cookies like a pro, in no time. Our expert instructor, Rachel Van Stratton is a cookie decorator extraordinaire, so you’ll be learning from a very talented cookie pastry artist. 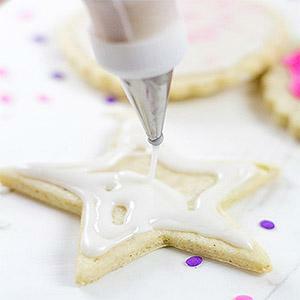 It will be an interactive morning as you explore the fundamentals of cookie making, handling, baking and decorating. Rachel will show you how to make a basic Vanilla Sugar Cookie Dough, then move on to tips and techniques for rolling it out, cutting them, and baking. While the cookies are baking and cooling, she’ll get your imagination flowing as she shows and instructs you how to make the perfect Royal Icing. Then she’ll dive into decorating techniques like consistencies, coloring, piping, flooding practice, painting, embellishments, and learning about decorating supplies like tip-less bags and scribe tools. You’ll get down and dirty into the decorating details as you practice what you’ve learned and work on colorful designs, step-by-step. Valuable hands-on experience as well as step-by-step written instructions as she shows you how to use these techniques to transform a plain cookie into some of her favorite designs. Don’t worry, she’ll have some sample cookies decorated to show you how it’s done. With all of the great tricks and tips such as borders and flow icing that you'll learn today, you’ll leave class with the confidence and know-how to recreate beautiful cookies (from scratch) at home for any special occasion. Sun 6/23/19 10:00 a.m. - 2:00 p.m.